Was the first and most important of the great roads which the Romans built. The road was constructed in 312 BC by censor Appius Claudius, and originally connected Rome with the Alban Hills. Begins at Porta San Sebastiano and continues for nine kilometers, at times through open countryside with cluster pines and cultivated fields. 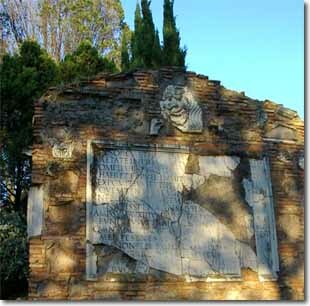 The Ancient Appian Way is still lined with antique tombs, churches, catacombs, sepulchers and mausoleums. Some of these displayed much monumental greatness, as in the Tomb of Cecilia Metella, famous funeral monument, dating from the last decades of the ancient Roman Republic.